The new VW Touareg is a tour de force: 4.88 meters long, 2.3 tons heavy, full of technology and over 60,000 euros expensive. But is it good enough to challenge the Mercedes-Benz GLE and Volvo XC90? VW has a new boss. 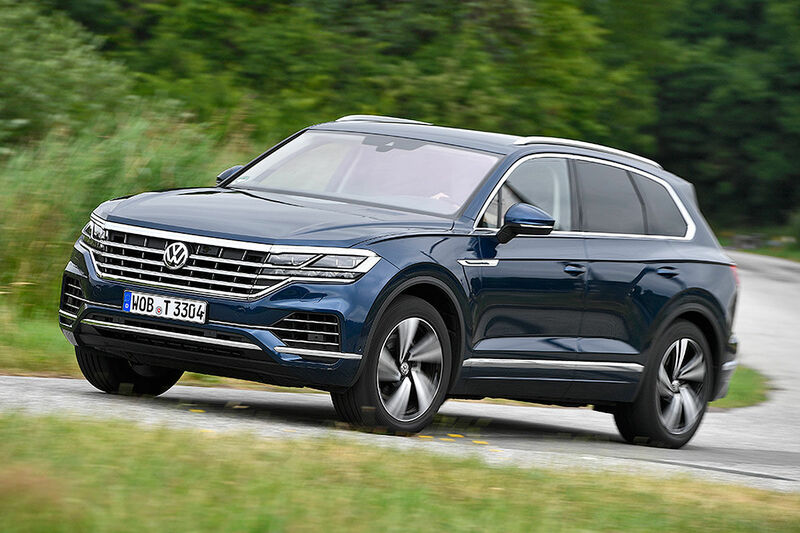 After the end of the Phaeton two years ago, the new Touareg now marks the upper end of the range. 4.88 meters long, 1.98 meters noticeably wide – have fun in the parking garage – and 2.3 tons heavy. The well-kept design, except for the large chromed front, is pleasantly restrained and very skillful in detail. But large noble SUVs is a formula other makers also do well. Volvo for example offers the XC90 – already on the market again since 2015. The Mercedes GLE is even older as it is basically a ML from 2011 at its base and will have a successor this year. Until then, the VW trumps ahead. With even more space than the other two – which are already spacious. Particularly striking is the enormous inner width. In front the Mercedes offers six, the Volvo even seven inches less width. So there is plenty of space and in the rear a split longitudinally movable rear seat. The trunk now swallows 810 to a maximum of 1800 liters – the predecessor was 697 to 1642 liters. The decor looks modern and clear, the test car came with twelve-inch display for the digital instruments and a huge 15-inch touch screen for GPS, climate, hi-fi and so on. In the package (Innovision cockpit) with Navi this costs 3500 Euro. But not all news are good. The variety of functions and the numerous options make the operation really not easy. And the voice control responds partly delayed and comes in the scope, for example, not to the high level of the MBUX system in the Mercedes A-Class – also vehicle functions can not be controlled in VW. In other areas of the cockpit costs also seem evident: In the lower part of the cockpit VW uses simple plastics, the shelves with can holders on the center console can not be closed (such as the Volvo with a fine blind) and the cargo area is not flat – in the XC90 is exactly for the seat additionally lowered. Just examples, and all not earth shattering, of course, but slightly disappointing at a test car price of 77,640 euros. The trunk in the Volvo swallows with the folded rear bench 1886 liters. 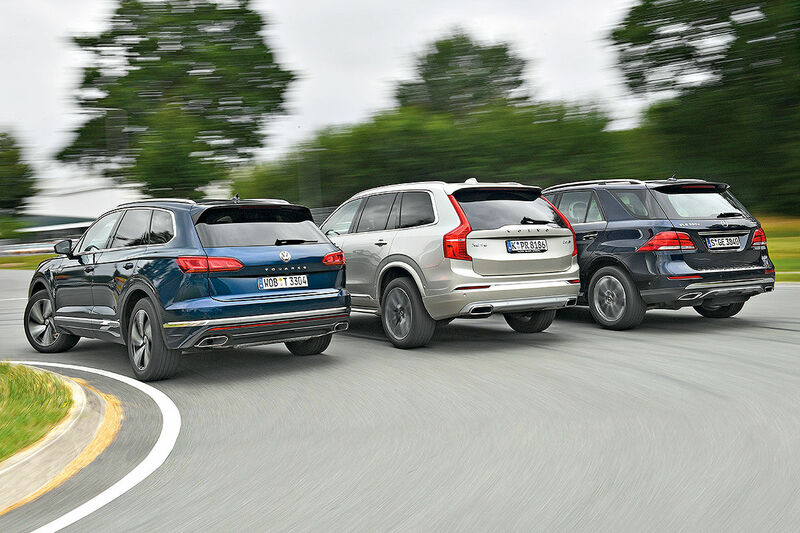 However, the XC90 with 501 kilos just under the lowest payload, the trailer load of 2.7 tons is the lowest – VW and Benz go up to 3.5 tons. The Volvo pleases above all with its restrained, fine and clean processed ergonomy. The most striking element is the nine-inch screen in the middle of the dashboard which handles all sorts of functions – Hi-Fi, Navi, Security Assist, Climate and so on. The system is similar in operation to a standard tablet – so everyone can use it. However, you usually use your tablet sitting relaxed on the sofa and not when you drive at 130 km/h. That makes a difference. The space in the XC90 is very neat, corresponds pretty much to that in the Mercedes, there are tightly cut, long-distance seats (comfortable) plus a wonderful upholstery. In the Mercedes you feel relocated to the past. With an older Comand system and small buttons the baroque interior and the small-scale operation logic seem quite antiquated – but that might be something many people like, nostalgics, for example. The large front armchairs are comfortable, also in the rear you sit very decent, the trunk swallows at its maximum volume 2010 liters. Also worth noting the allowable payload of 649 kilos. The Mercedes is powered by a 3.0-liter V6 with 258 hp, which forms a friendly ensemble together with the somewhat sleepy nine-speed automatic gearbox. The V6 pushes early strong and proves powerful (620 Nm already at 1600 rpm), but seems a little inhibited at higher revs. It also runs rougher than the VW, which is always beautifully muted but without excitement. The air suspension (2035 euros) is still from the old school, soft on long waves and a little displeased with short bumps. The decoupled, tough steering fits in with the comfortable, lightly padded driving experience. 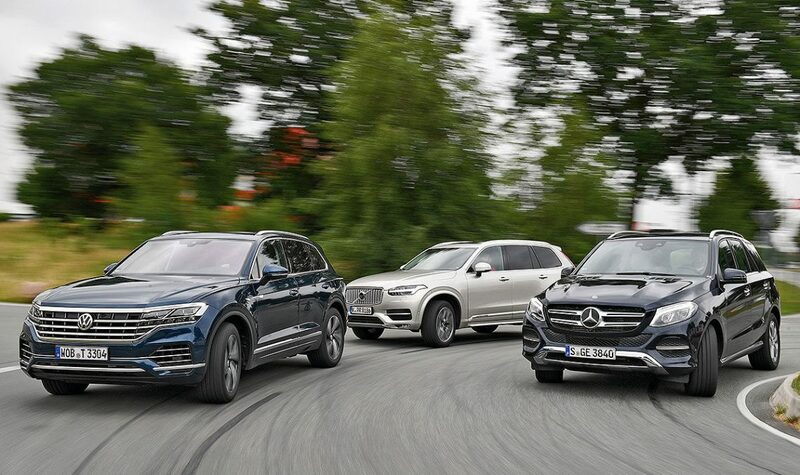 In short: the GLE does not have any further dynamic ambitions. VW is still building very good cars. Like the new Touareg, which drives to the top here. Second is the style-conscious Volvo, and almost an insider’s tip is the Mercedes – sorry, but age is too evident here. The new VW Touareg is exceptionally stunning. I truly like the interior and the designs on this new model as it has definitely changed the concept of what a Touareg used to be before. The nine inch screen in the dashboard is definitely a plus, especially with the navigation option. But I couldn’t help but wonder what brand did VW select to opt the Hi-Fi sound system in the new Touareg? Moreover, the front passenger AC compartment in the Touareg is excellent. I’m sure the co-driver wouldn’t complain about the temperature anymore. Surprise with the GLE’s old suspension system, I am still amazed that the Mercedes Benz costs the lowest among the three predecessors. However, Mercedes often charges more for additional options, such as the Premium speakers, Distronic Plus, even the phenomenal ambient logo lighting in the side mirror. I have previously driven the GLE 350 before, and was satisfied with the drive, experience, and looks of the cars. I noticed that the GLE tend to sound louder compared to the ML, however it is still a great replacement. The GLE that I drove looks fantastic, until I saw the price list. Since the GLE is a fully-optioned built, it costs over $79,000 vs the regular GLE model that costs around $58,000. That is a huge difference just to add certain features into the car. It would be great if Mercedes could add certain options as complimentary.